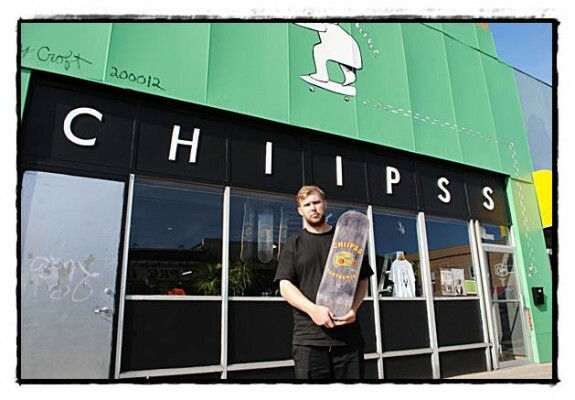 Pat Miller, 26, recently moved his skate shop "Chiipss" from Plymouth to Hamtramck. The store's new location is at 10229 Jos. Campau. Hamtramck’s newest storefront isn’t exactly a chip off the old block. Rather, it’s more of an indication of what the city’s future has to offer. 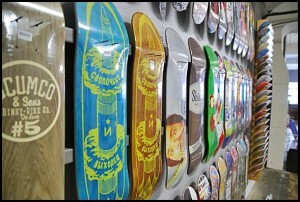 Chiipss – a skate shop located at 10229 Jos. Campau – is the latest in a string of businesses to open at the hands of an entrepreneurial young person. And as more Millennials follow the lead of people like Chiipss owner Pat Miller, 26, the city can only stand to benefit. That was back in March, when the city was receiving a lot of negative press due to a series of violent crimes. Miller says that when he told others he was considering moving his store from Plymouth – where it had operated since 2007 – to Hamtramck, they told him he was crazy. In addition to cheap rent (see this paper’s classified section for a comparable deal on a downtown location), Hamtramck was also soon to be proximal to the new Ride It Sculpture Park, a skate park/interactive art exhibit located in the NorHam neighborhood at the intersection of Klinger and the Davison Freeway. Being in the business, Miller was well aware of the project underway and lent a generous helping hand. Along with Andrew Davis (the partner in his other endeavor, Barber Shop Screen Printing), he co-organized the sale of 100 cruiser skateboards decorated by local and international artists. The project, titled “GoodWood,” raised $25,000 toward the construction of the concrete park, which today consists of transitional bowls, quarter pipes, banks and other aspects that give it “a good flow,” as Miller puts it. Moreover, through the organization “Boards for Bros,” he was able to redistribute 140 gently used skateboards that were donated, refurbished and subsequently dispersed throughout the neighborhood. As a result, the skate park is regularly frequented by not only kids from surrounding cities, but kids from the surrounding neighborhood as well. Even with all that going on, he still managed to get his shop up and running. The new location is much larger than the last one, a fact Miller illustrates by comparing the old store’s size to the half-pipe located inside the new store. That’s right – after you pick up your shoes, T-shirts, decks, trucks, custom screen printed designs and whatever else you need, you can test everything out right in the store. And while you’re there you can see the new facade, a simple yet effective mural of a skateboarder done courtesy of local artist Jay Croft. A perfect time to check it all out is this coming Saturday (Sept. 29), when Chiipss celebrates its five-year anniversary of being in business. Festivities start at 7 p.m. with free food and drinks as well as a sale on merchandise. At 9 p.m. there will be a Ramp Jam, which is essentially a friendly competition where skaters of all levels can showcase their tricks for a welcoming and encouraging crowd. At 10:30 p.m., the party heads next door to Belmont Bar, where the band The Sugarcoats will rock the night away. Chiipss is located at 10229 Jos. Campau and is open weekdays from 2 to 8 p.m. and Saturdays from noon to 7 p.m. For more information call (313) 874-5336, or visit www.chiipss.com.